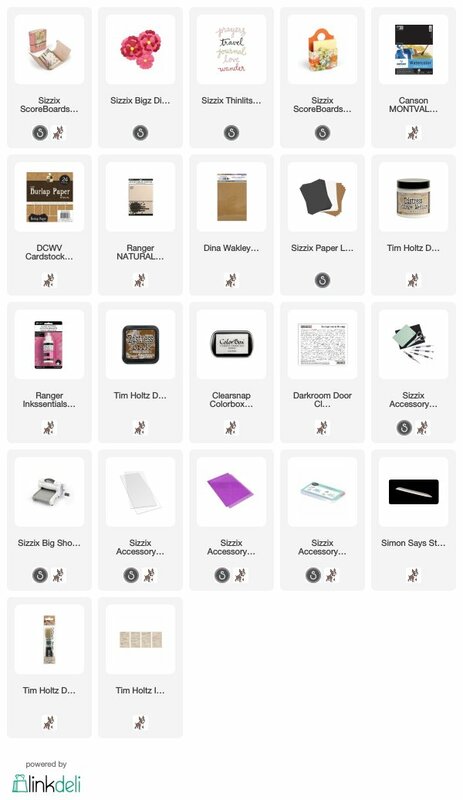 Hello crafters! During February, the Eileen Hull Inspiration Team has been sharing projects with hearts, flowers or dragons. 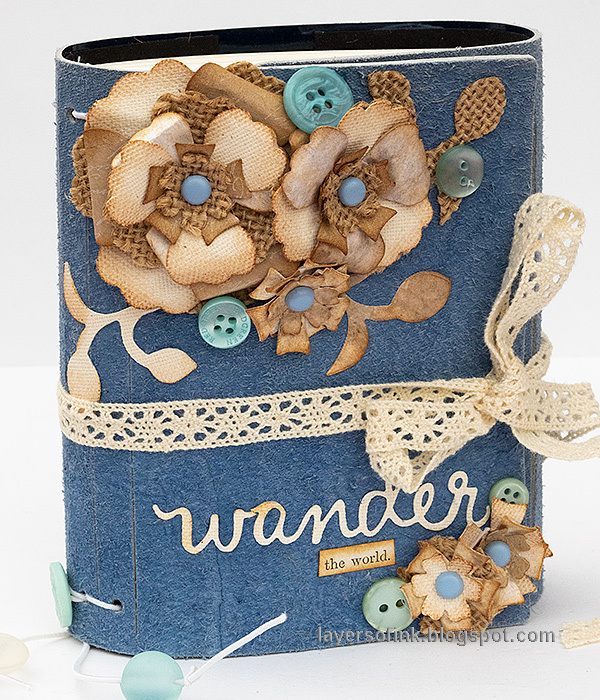 Today, I have a wrapped journal tutorial to share with you. I just love to make wrapped journals. They have such a great size, are fun and chunky and also easy to make. Today's journal is made from patent leather - I thought it was faux leather, but Eileen let me know that it is patent leather. And I used it inside out. :) But I liked the texture of the inside much better than the glossy patent texture. 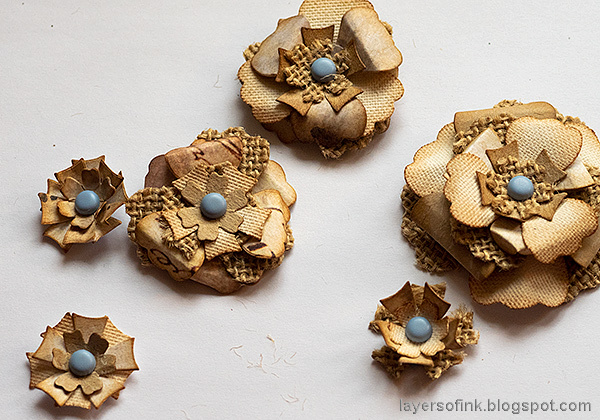 I wanted to stick with neutral colors in combination with the blue, and used various textures to create my layered flowers - burlap, canvas, kraft paper and patterned paper. 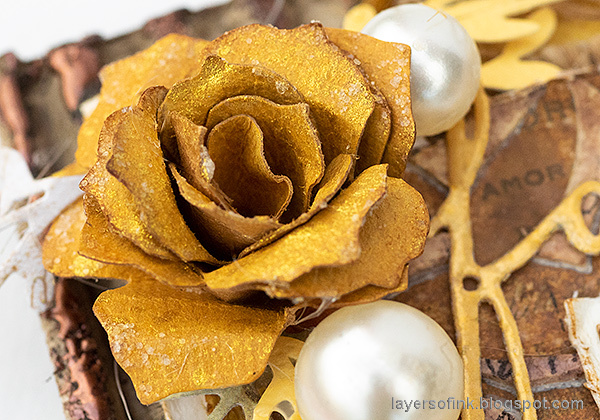 Mixing various surfaces in one dimensional flower is a favorite technique of mine, and it is also a great way to use up scraps. I might use this book for flower sketches. 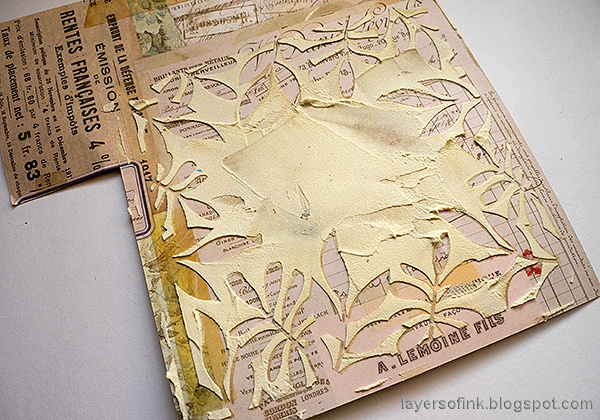 Start by die cutting the cover using the Wrapped Journal die. You need the extended cutting pads, but the die fits perfectly in an ordinary Big Shot or Vagabond. 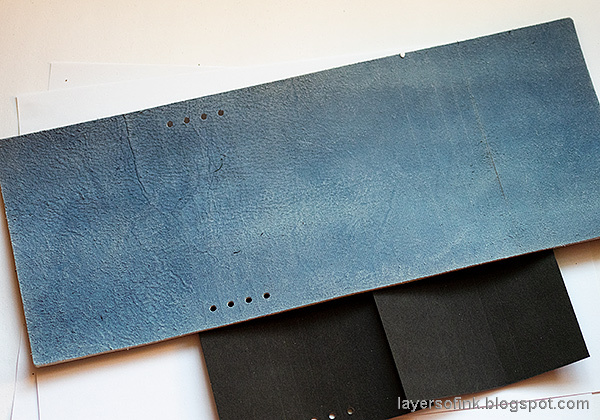 I also die cut two pieces of black Sizzix Paper Leather, to use as extra support along the spine, and where the scorelines are on the second fold. 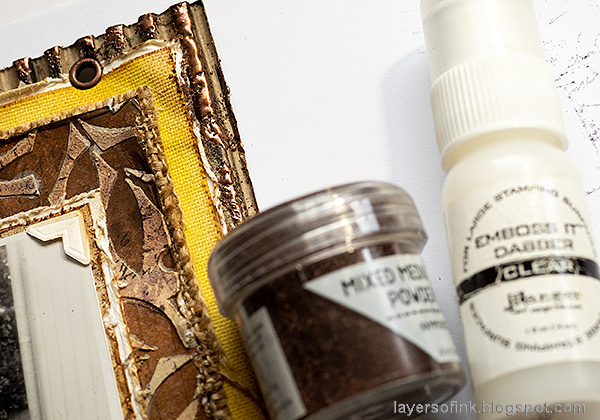 Glue the black pieces to the journal and place under a heavy book. 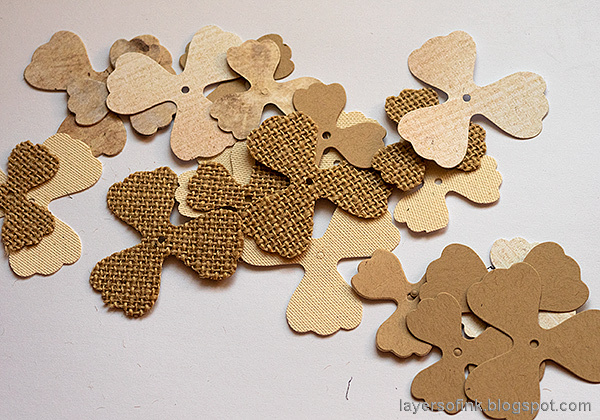 The flowers were die cut with the Pansy Flower die, from burlap, canvas, kraft paper and various patterned papers. I also die cut some smaller flowers an leaves, using the Caddy Bag die. 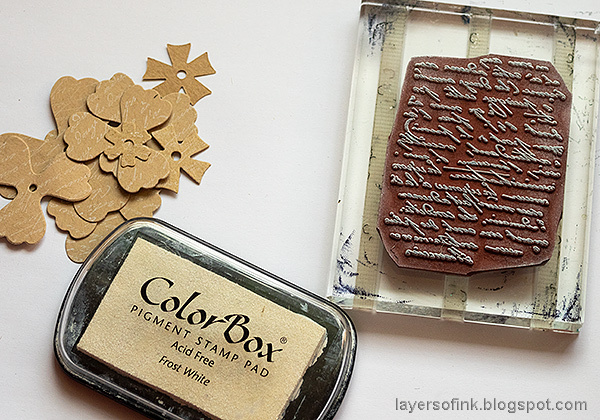 Stamp the kraft pieces with a script stamp and white pigment ink. I used the Darkroom Door French Script Texture stamp, but any script stamp will work, such as their French Script. Ink the edges. 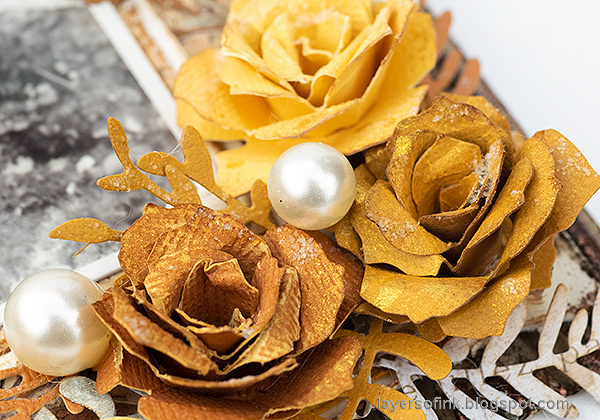 Give the flowers shape using the Sizzix Paper Sculpting Tool Kit. I used both the ball tools and the pair of tweezers (to roll back the petals). 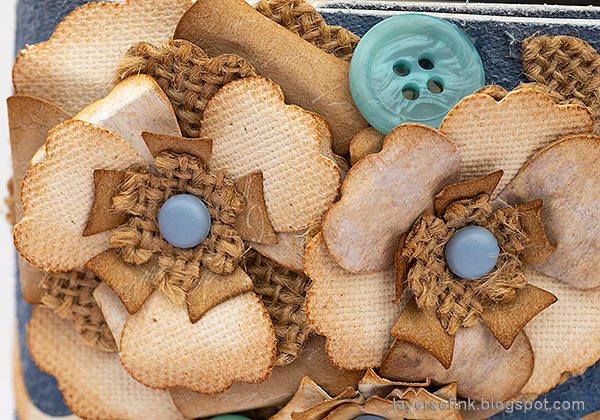 Layer flowers together and place a brad in the center. 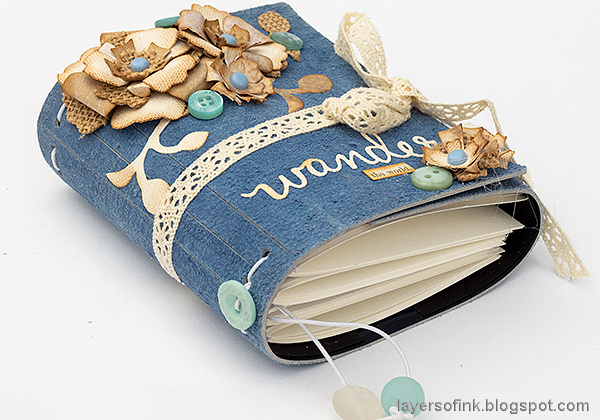 A great thing with making your own journal, is that you can fill it with you favorite paper. For this journal, I used watercolor paper. You need four signatures of about six sheets of papers in each, about 7.1 x 4.8 in (19.5 x 12 cm). Fold and score. 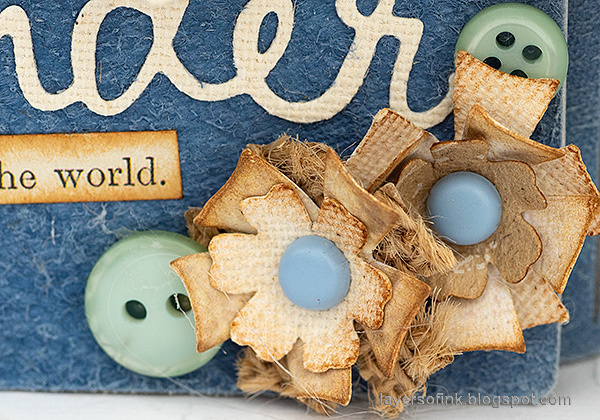 I stitched down the center with my sewing machine, but you can also use staples, or even leave the paper lose. 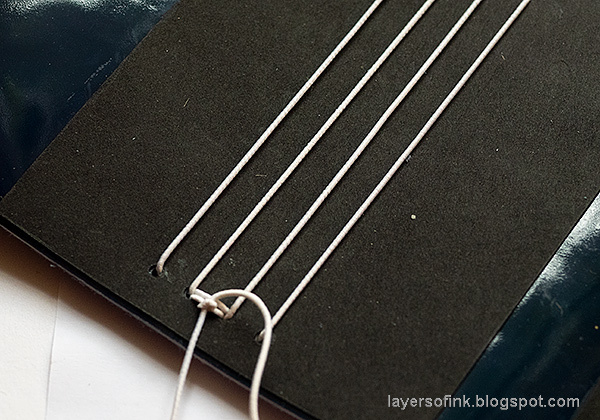 To bind the journal, use a piece of elastic string, going back and forth. Just tuck the signatures under the strings and you are done. I tied a button to the back for an extra details, before making a knot on the inside. 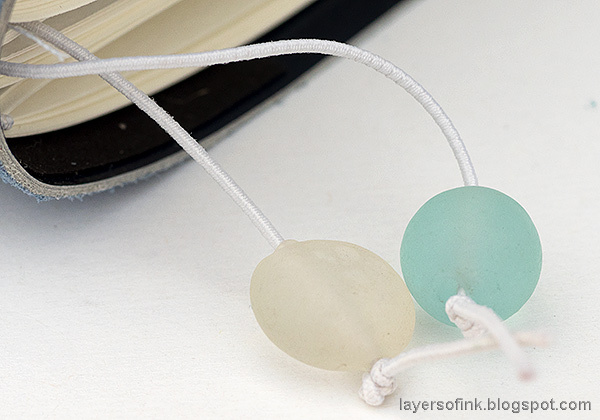 For an extra touch, tie two beads to the strings. I used to do quite a bit of jewelry, so I have a lot of beads at home, sometimes just a couple of each kind, and they are perfect for this. Glue the flowers to the cover. I had quite a few left-over flowers for a future project. Here you can see the cool texture of the background. This patent leather was sent to me (thank you Eileen!). 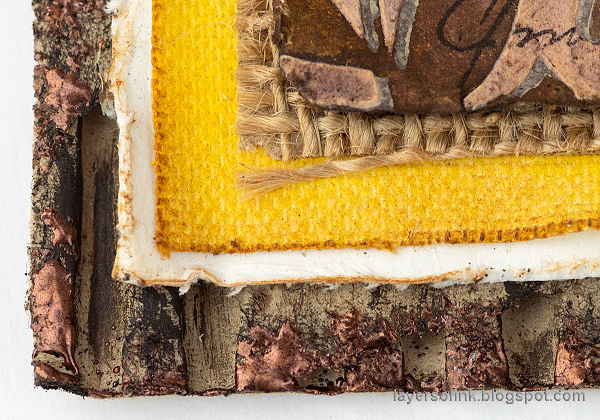 For another leather journal, check out my Wrapped Leather Journal. 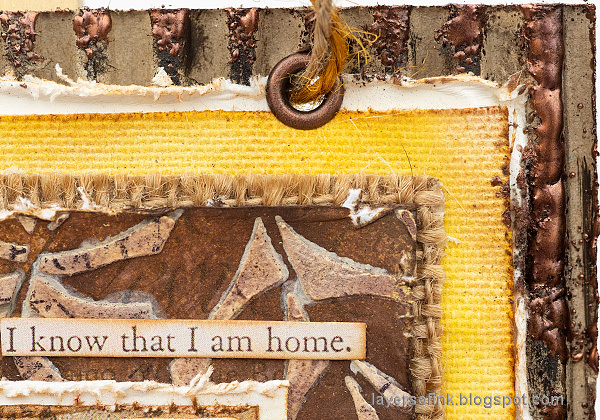 As a title, I used one of the dies from the Journaling Words set, die cut from canvas, and a piece of a Tim Holtz Clipping Stickers. I tied the journal with a a piece of lace. For alternative ways of closing it, check my Leather Wrapped Journal and my In The Forest journal. Hello friends! I hope you had a good weekend and that you got some crafty time. We had spring in the air here, but the colder weather is probably coming back again. We are also looking forward to celebrating Leo's birthday this week. February is a big birthday month here. He wants to eat tacos and have a fire truck cake. 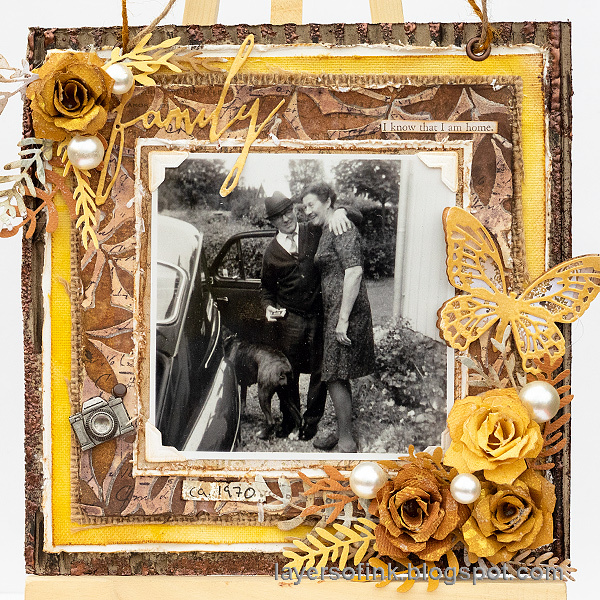 The theme for this week at the Simon Says Stamp Monday Challenge Blog is Vintage/Past Times, which is of course a favorite team for us all. 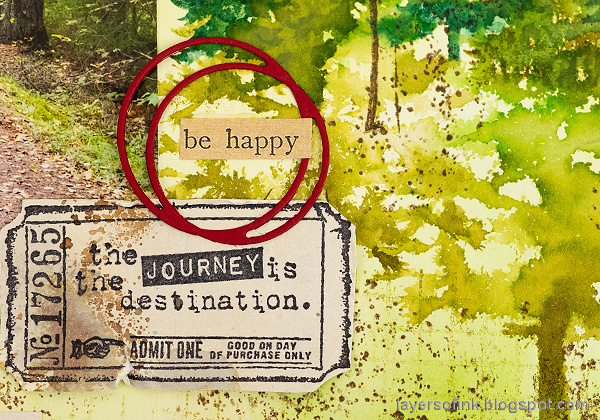 Don't miss the project by our February guest designer Lucyna Marynowska, with her blog u Luli. I wanted to do a photo project this week, and particularly something about my paternal grandmother, since I recently met an older relative who shared memories about her. My dad took this photo of my grandmother and one of her brothers-in-law. 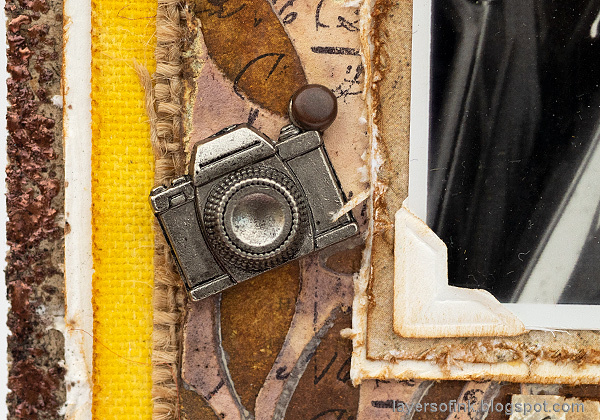 You can use any type of photo on this vintage style wall-hanger, or use a stamped image as the focal point instead. The wall-hanger is 7 x 7 in and has a lot of layers. 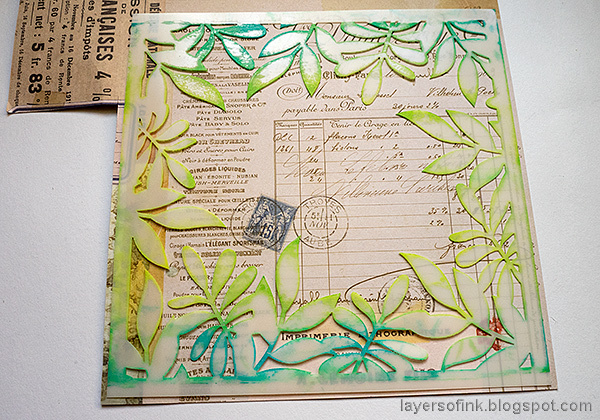 I started out with a patterned paper and the Leafy Frame stencil by SSS. Mix a little paint into paste and apply with a palette knife. I started out using only paint and then changed my mind, which is why you can see a small paint shadow on many of the leaves. When dry, mist with Distress Spray Stain. Use a paper towel to dab off stain from the paste areas. When dry, stamp with a script stamp. The stamp I used is from a receipt (as was the patterned paper), which works well, since my grandmother ran a shop. 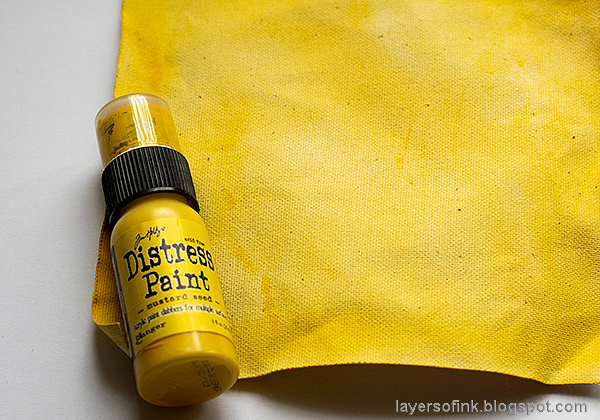 Paint natural sticky-back canvas with watered down Mustard Seed Distress Paint. 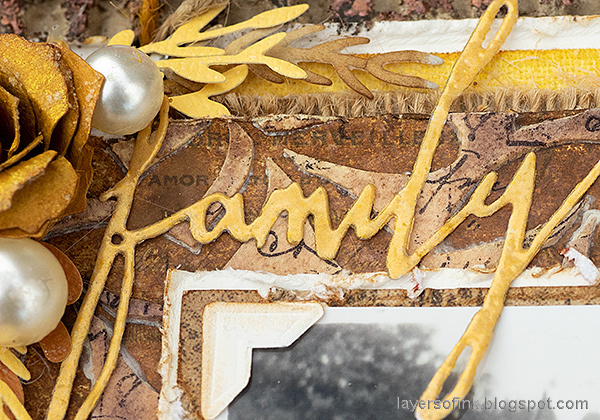 Or you could use yellow cardstock, but I wanted lots of different textures. 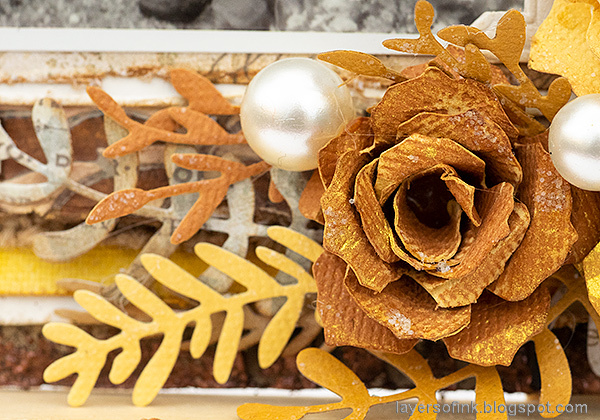 The roses were made with Tim Holtz's Tattered Pinecone die. 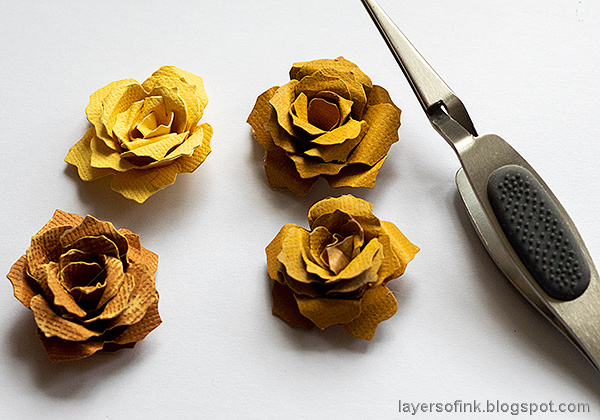 Die cut from various shades of yellow. Sand slightly. Use a pair of tweezers to roll the spirals into a rose shape. I used hot glue - if you use hot glue, be very careful not to burn yourself. 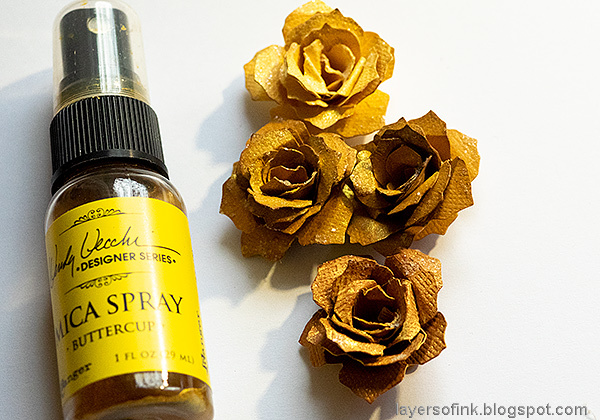 For extra shine, mist with Buttercup Mica Spray. I love the warm yellow shine you get from this mist. 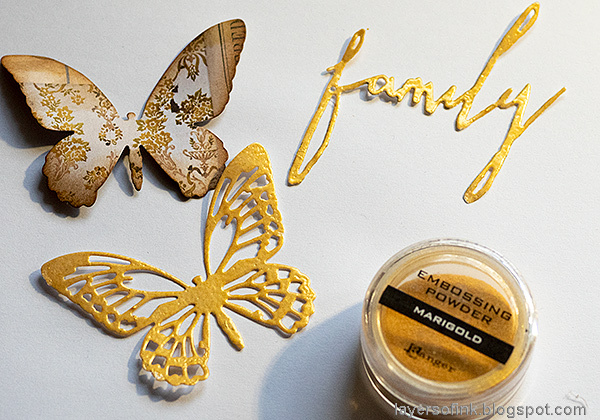 The Mini Detailed Butterfly was die cut from patterned paper and white cardstock. I also die cut a word from white cardstock. 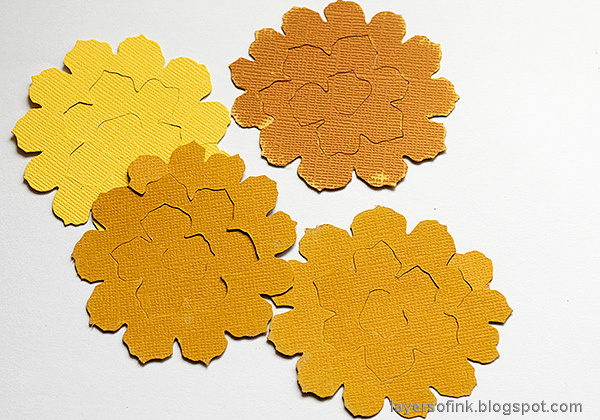 Apply embossing ink and emboss with Marigold powder, which has a lovely yellow pearlescent shine. 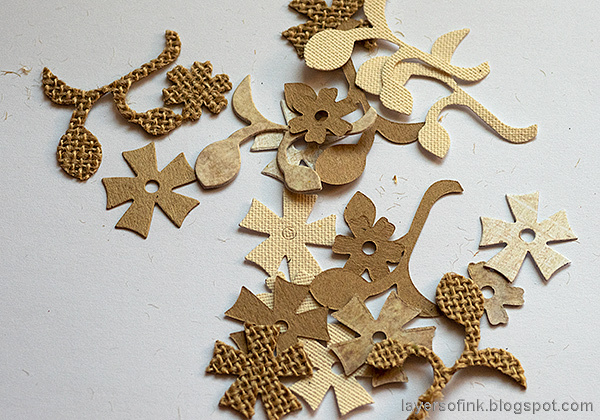 Die cut foliage using the Funky Floral 1 and Funky Floral 2 sets, from patterned paper and cardstock. 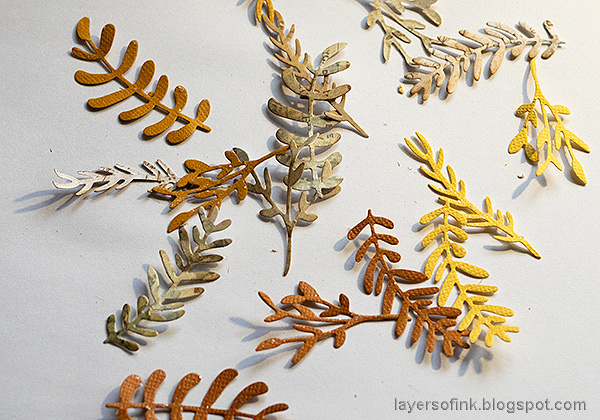 It is a great way to use up scrap patterned paper. Distress all the edges and layer together. 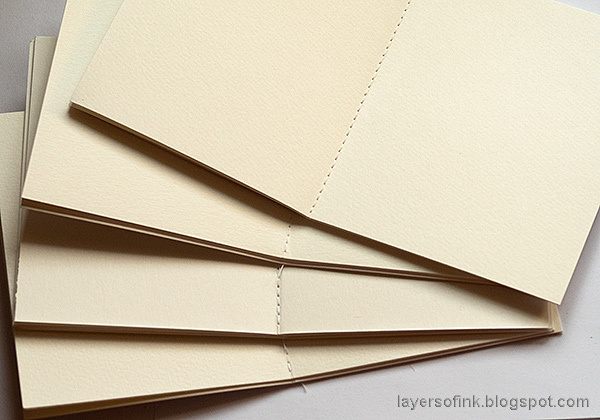 Add two layers of watercolor paper, for even more dimension. 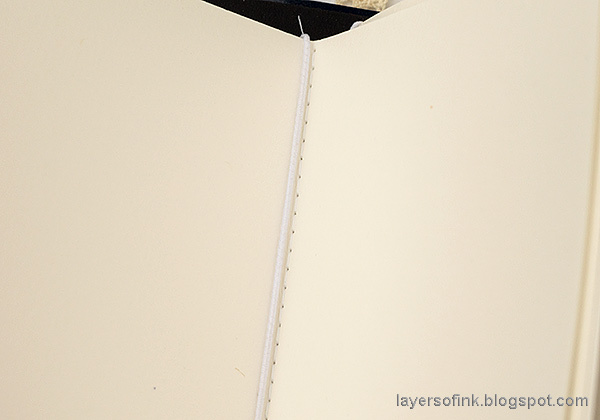 Remove the top layer of a piece of cardboard to use as a base. Glue everything together with Matte Medium. 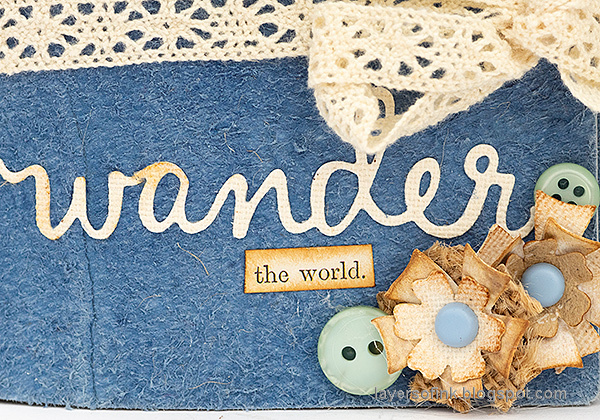 Apply embossing ink along the edges and emboss with the cool Mixed Media Hammered powder. I also added a tiny bit of Stickles to the roses, and some baubles. Here you can see all the layers better. The photo was layered on patterned paper and watercolor paper, then comes the leafy panel, a piece of burlap, the yellow canvas, another piece of watercolor paper and finally the cardboard. I added photo corners to the photo, to give it even more of a vintage look. I also used a camera embellishment. The Hammered powder gives a really cool effect. I used it on my Typography Tag too. I never get tired of using dimensional flowers on projects. Here you can see the shine from the mica powder a little better. 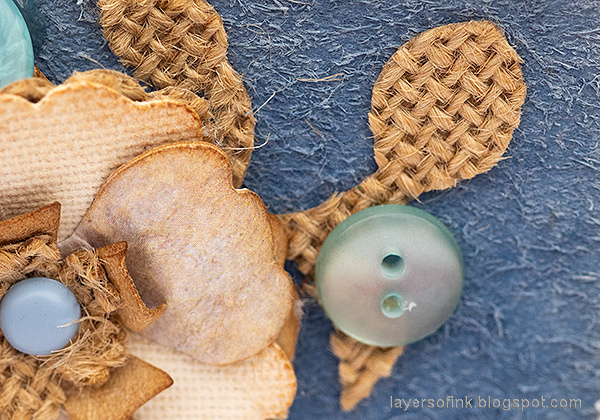 It is such a quick way of adding shine and texture to a project. 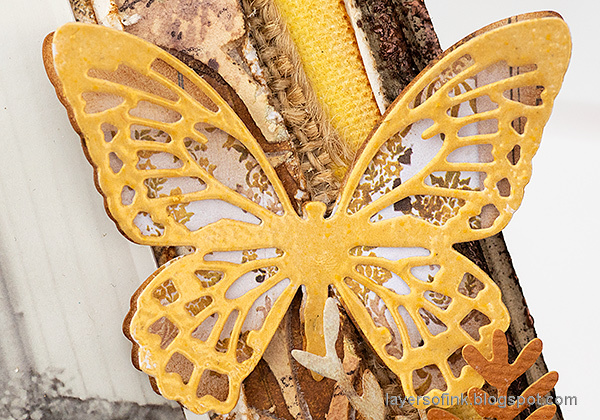 The detailed butterflies look lovely with the top layer being embossed. 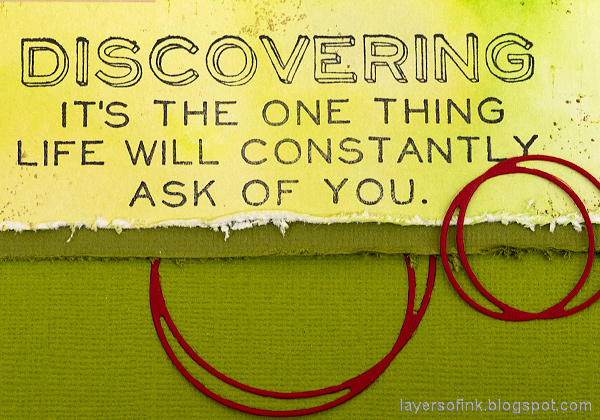 I used the same technique on my recent Typography Tag project too. 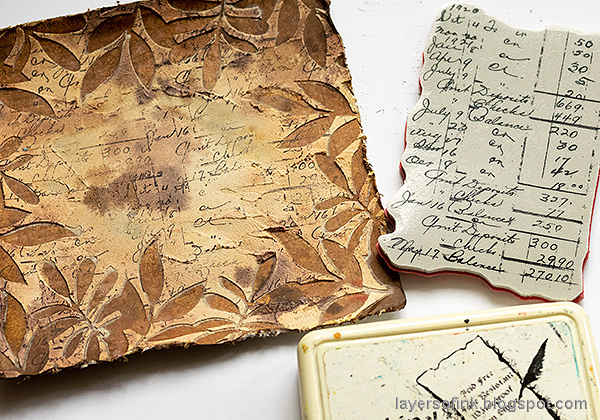 I added some journaling to the back of the wall-hanger, about memories of my grandmother. 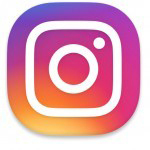 I hope you will join us this week in our Vintage/Past Times challenge. As always, you have a chance to win a $50 gift voucher to do some fun shopping at Simon Says Stamp. You have until next Monday 8am Ohio time. 1pm UK time, 2 pm CET to join in. Hello friends! I hope you had a great weekend. My family visited and we had a fun birthday party for Anton. He is getting so big. Spring is in the air and the first snowdrops have made their appearance. I am documenting it in the Signs of Spring notebook that I made last year. 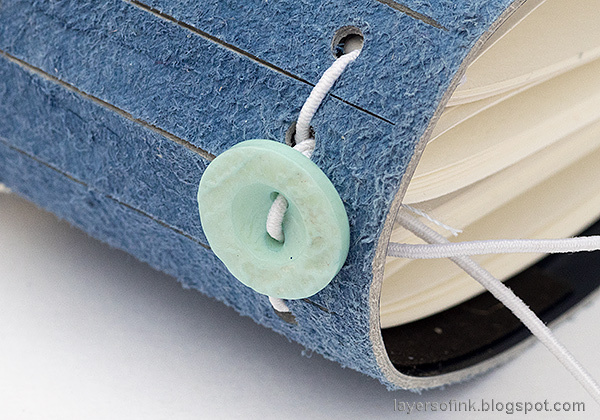 This week at the Simon Says Stamp Monday Challenge Blog, we have a Things With Wheels challenge. How fun! 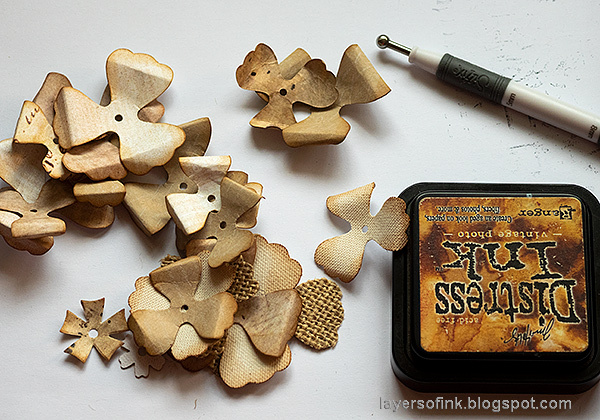 I hope you can join us, and don't miss the project by our February guest designer Lucyna Marynowska, with her blog u Luli. My favorite thing with wheels is the bicycle and I found this photo from a couple of years ago, from a forest bike ride. 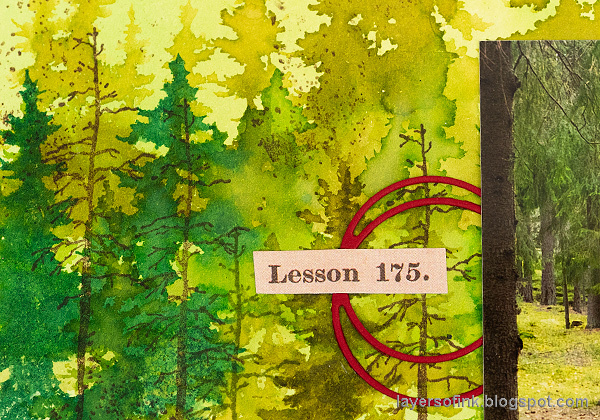 The forest in the photo was extended onto the background, using stamps and Distress Ink. I used almost only shades of green, with just the circles beting red, to repeat the red in the photo (his helmet and the bike). The journaling is on the back. 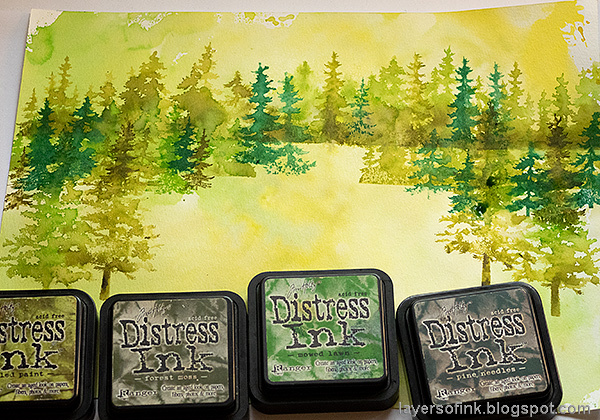 The background watercolor paper was in my scrap paper box and had been colored with Distress Inks. 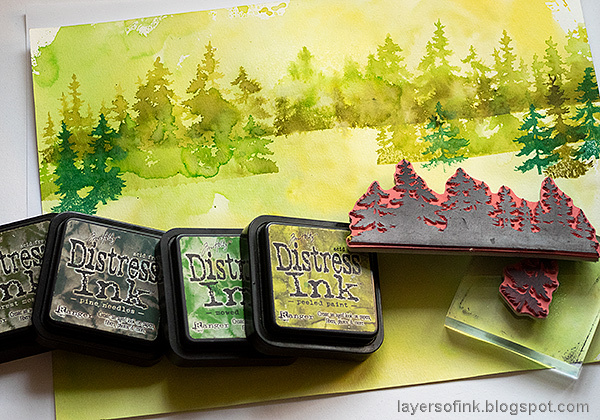 I used various pine tree stamps by Tim Holtz and inked them up with four shades of Distress Ink. 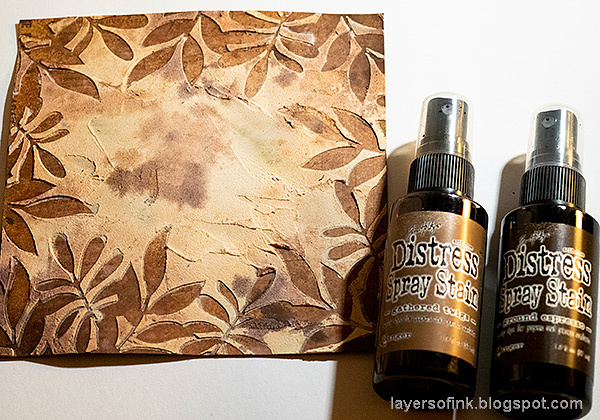 Mist about four times before stamping. Most of the stamps are from the fabulous Tree Line set. Continue adding more trees to fill up the scene. I used four larger trees in the foreground, from the Just Believe set. This is a Christmas stamp set. Don't forget your seasonal stamp sets during the rest of the year, since many of them contain stamps that can be used for non-seasonal projects. Since the photo was going in the middle, I didn't stamp any trees there. Next, I added texture with a splatter and a grid stamp, using Potting Soil and Fern Green Archival Ink. Add a branch tree here and there with the brown ink. 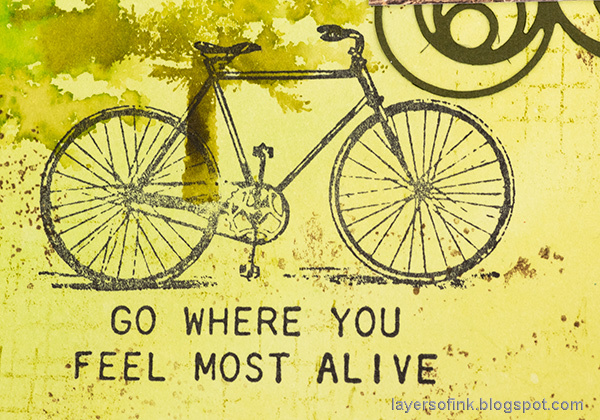 I also stamped a bike and a bunch of sentiments. The circles were die cut from red paper with the Simon Says Stamp Circle Loops die. The sentiment comes from Tim's Perspective set. 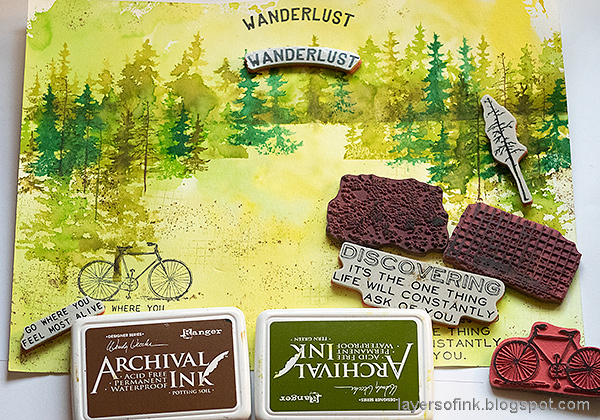 The bike stamp comes from the Purely Random set, and I used one of the great sentiments from the Nature's Wonder set. The different shades of green makes the forest look alive and also adds dimension. 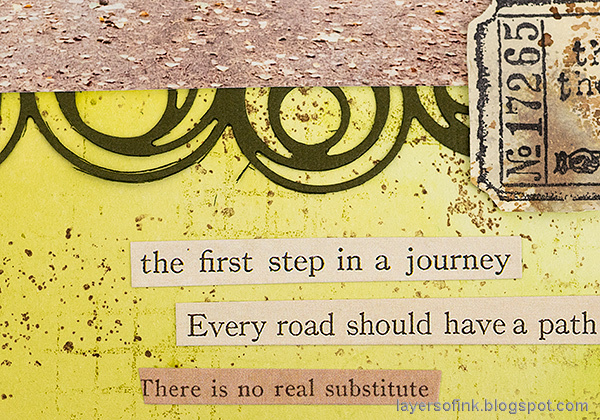 I used the Odds and Ends set and stamped a ticket and a sentiment on an inky paper. 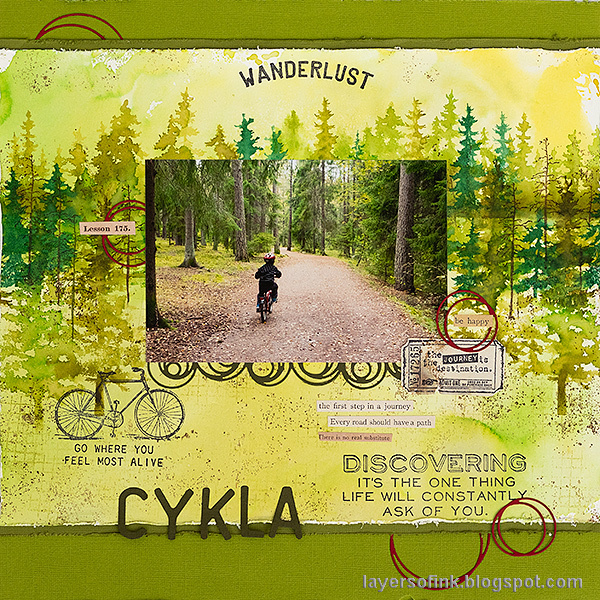 The layout was finished with a Spinner Trail border die cut from dark green paper and some Clippings Stickers. I hope you will join us this week in our Things With Wheels challenge. As always, you have a chance to win a $50 gift voucher to do some fun shopping at Simon Says Stamp. You have until next Monday 8am Ohio time. 1pm UK time, 2 pm CET to join in.